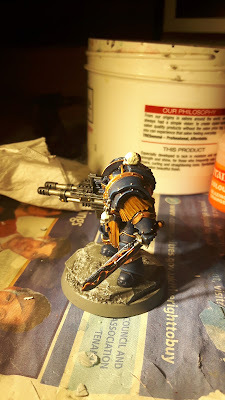 Following my previous post on my Betrayal at Calth Night Lords Terminators I received a request to walk through how I painted the power sword. Ever the obliging fellow, I have provided below for your delectation. You're welcome. The first stage is to basecoat the sword in Abaddon Black. Simple enough. It's worth noting that I've used Citadel paints exclusively throughout this tutorial. Next, paint the power feed and hilt in Boltgun Metal (I don't know the new colour but I'm sure someone can correct me). Now, wash those metallic areas with Nuln Oil. Now for the fun part, painting the power field. I've found that there are two approaches to this depending on the desired final effect. Painting a hard, jagged pattern gives a more lightning-like, electrical look. Painting more rounded shapes leads to a more fiery, magma-looking feel. As I was using a red palette here, I've opted for a slightly more curved pattern. Anyway, the first stage is to paint the desired pattern in Mephiston Red. Make sure it's sufficiently thin to give a smooth flow from the brush and so that it doesn't dry claggy or raised from the blade. I find it looks best if this is painted radiating outwards from the power source and moving towards the blade tip. If you can concentrate the lines nearest to the power source, so much the better. Don't worry if it looks a little rough at this stage, things will tighten up as we go. Once this is done and you're happy with the shapes, it's time to paint a second line of Blazing Orange inside the first set of lines. This shouldn't be too hard, providing the red lines aren't too thin. If you're struggling, try widening out the red layer slightly. Again, make sure the paint is sufficiently thin. Now for the tricky part, painting the final set of fine lines in Yriel Yellow. These need to go inside the orange lines in the same way as before. With the yellow, try to get the thicker lines in the areas where threads join and go finer along the length of the threads. 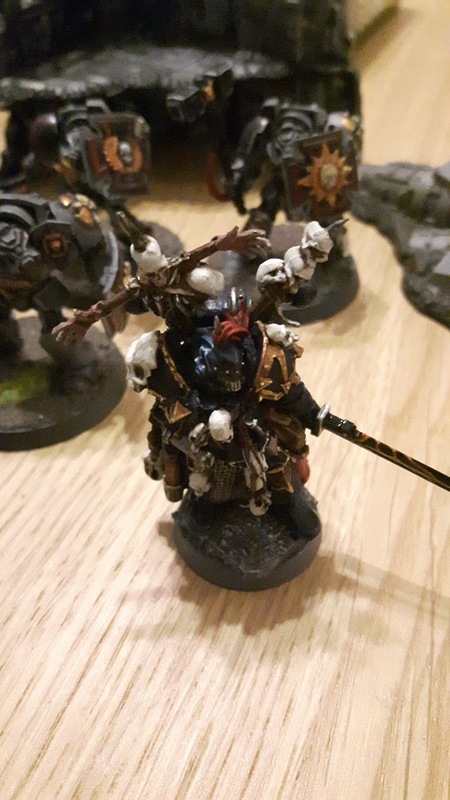 Keep at it until you've got an effect you're happy with, and remember, thin your paints! Finally, give the whole thing a layer of Ardcoat for a nice glossy finish. This really sets off these power weapons and makes them stand out to the eye. Hope you found this a useful guide. In the words of many a vlogger: Like if you like this, subscribe if you want to..........comment if you own a keyboard? I think boltgun metal is Lead-Belcher now, Mythril is Runefang Steel. Thanks man, that's high praise coming from you!